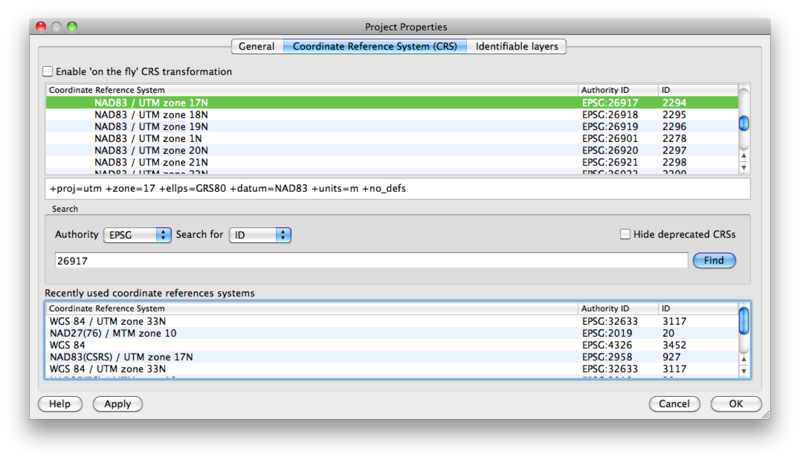 The great thing about geospatial metadata standards is that there are so many to choose from. When slinging files about from user to user, it seems that mostly the ESRI stuff (well, the stuff we can pick apart, anyway) is used, plus some sedimentary layers deposited as good ideas from other systems. 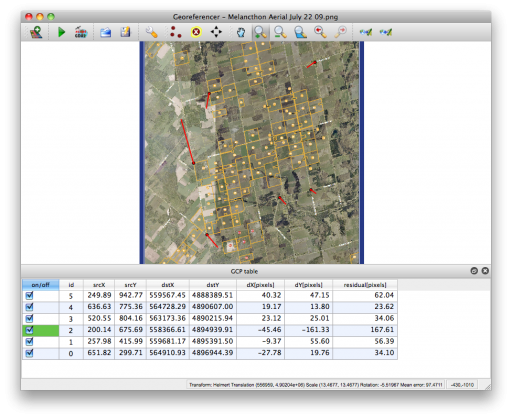 Commercial GIS systems are much less liberal, because all of them have the inertia of user investment. Manifold does things its own way. Rather than using broadly standard prj or wld files, Manifold accompanies every exported file with an XML metafile in its own format. I get sent a lot of bitmaps from Manifold, and if I want to do more than view them on the screen, I need to convert the metadata. Note that I’m doing what you’re supposed never to do — parse XML as if it were just some text format. If Manifold change their file format even slightly, this program will fail. The above seems to work on all the data I’ve thrown at it, although none of those test files included rotation terms. I don’t think I’ve ever actually seen a world file with rotation defined, so this may be a minor limitation. 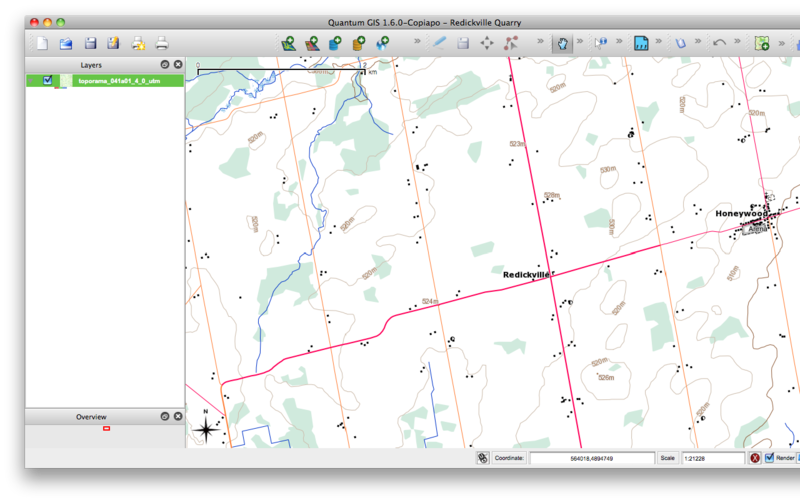 Quantum GIS (QGIS) has a very powerful image georeferencing module. 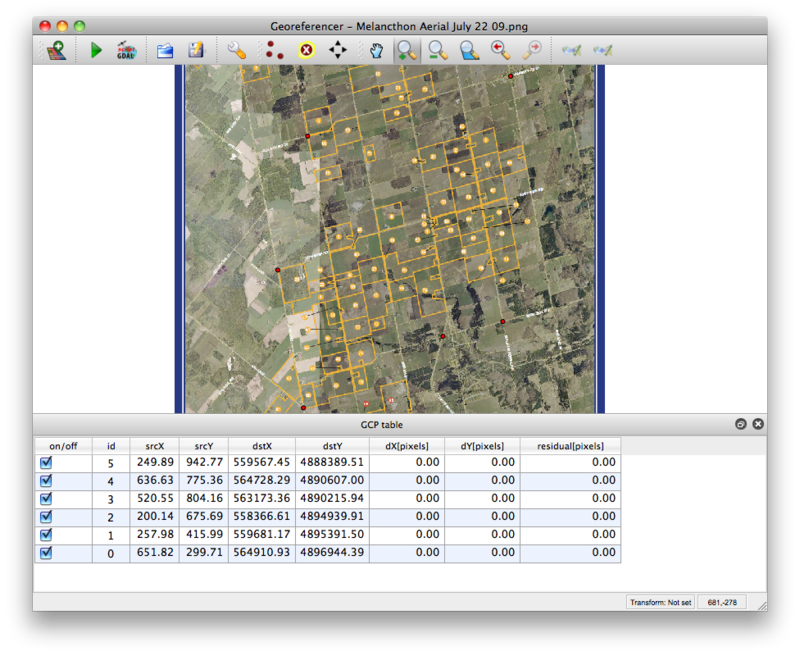 What that allows you to do is convert screen pixels to a map of an area. The pixels could be from a scanned map or from a screen image. Scanned maps can sometimes be a little distorted, but QGIS’s georeferencer can handle that, within limits. 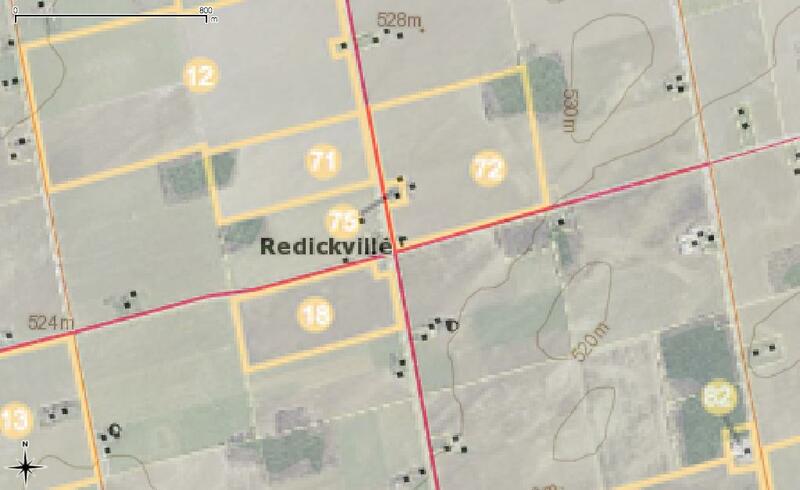 For an example, say I live in Redickville, ON (I don’t, but some folks do). I’ve heard from North Dufferin Agricultural & Community Taskforce (NDACT) that a large quarry is planned in my area. How close am I going to be from it? NDACT has a helpful map (2.4 MB PNG image) had a helpful map (which I’ve kept here so you can work through this: MelancthonAerial), but it has no scale. It’s clearly derived from something like Google Maps, so it’s not exactly a free image I can throw about. One thing about georeferencing is that both the source image and the map from which you take you control points affect the licensing of the final map. You’re ending up with a derived work. There are lots of sources of coordinates for your control points. You could always use Google Maps, but then you’re well down the derived work sinkhole. 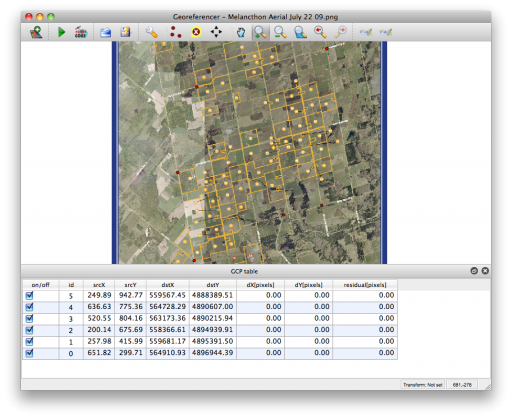 GeoGratis has a bunch of good data sources, and they are free to use. I’m going to use Toporama‘s digital image maps, as they’re clear and fairly accurate. Transformation Type: Linear is useful if you’re just adding georeference data to an already computer generated map. Helmert is a simple shear/scale/rotate transformation. The various Polynomial types will correct more gross distortions, but need many control points and can be processor intensive. Thin Plate Spline will distort your map locally to match GCPs; this can work well if your map’s a bit “vernacular”, but if your control points are wrong, your map will end up hilariously melty. Resampling Method: This controls how the output pixels are calculated. Nearest Neighbour is quick and blocky, but useful if you’re mapping an image that has sharp transitions. Cubic maintains more detail, while applying some smoothing at the cost of some detail loss and a fair bit of processing power. The other options can look nice, but eat CPU. This is worth experimenting with many options, as there’s no one solution for all maps. 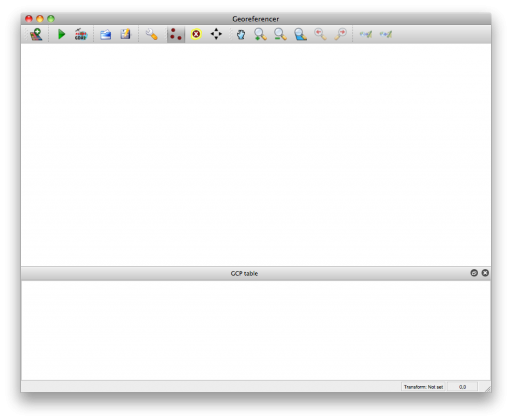 Compression: This controls the file size of the output GeoTiff file. 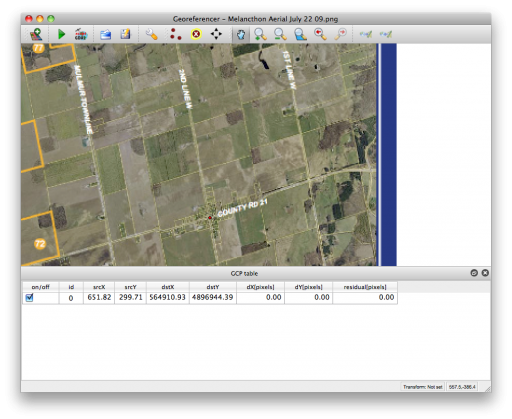 JPEG and Deflate can result in small files, but there’s a chance that other GIS systems can’t read the data. Note that JPEG is lossy, and will lose some detail. Don’t forget to set the output raster file, and make sure that the target SRS matches the CRS (EPSG 26917) you chose earlier. If you unselect the bad point, the plugin quickly calculates the residuals again. When this one bad point is removed, the residuals drop down to less than 1.0 for each point. I’ve got enough points for a Helmert transformation with 5 GCPs, but I’d probably want some more points for more complex transformations. 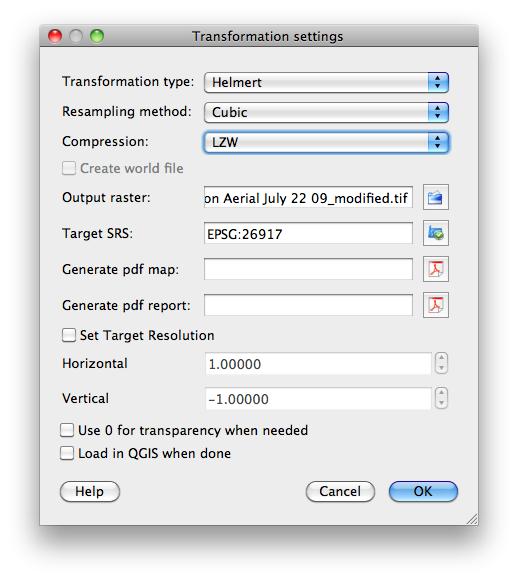 Once you hit “Start Transformation”, QGIS will create your referenced image. If you’ve chosen a simple linear transformation, it won’t create a GeoTiff file, but just a world file for your image. So to answer the hypothetical question, Redickville’s pretty well surrounded by this proposed quarry.